Sorry for the late post, but last Tuesday, as promised, I chose a winner for the bag contest. Random.org chose my blogging friend Tilly as the winner! I posted previously about a free photo editing class at JessicaSprague.com. That class was fantastic and led to me taking several more of her classes on everything from graphic design to photography. 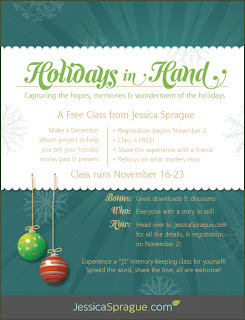 She is offering another free class this November all about preserving your holiday memories. The description says you do not need Photoshop skills for this class, so I think it is a writing/recording/preserving class. Join me! Go to www.JessicaSprague.com and sign up! Let me know if you sign up for the class. I will look for you in the forum! Ooooh....goody, goody! Thanks for the heads up! I signed up for the free class yesterday! Woo hoo!! !